The January 2005 Mussel of the Month is Coelatura aegyptiaca. C. aegyptiaca, as currently conceived, is widespread in western Africa and the Nile Basin. But, as currently conceived, Coelatura is a mess! Type of Nodularia sobaensis Preston (= C. aegyptiaca). BMNH 1923.6.8.1210. Soba, Blue Nile, Africa. Mrs. Longstaff! As a taxon, Coelatura is known colloquially among mussel systematists as a 'garbage pail genus'  the one thing the members of Coelatura have in common is that no one knows where they are suppose to go! 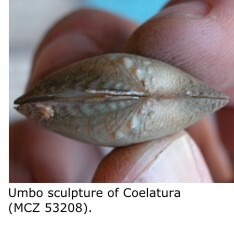 Coelatura is composed of about 30 little, green and brown-shelled mussels, many with rather restricted ranges throughout Africa. Coelatura aegyptiaca is the type species of the genus, so we can be sure that as long as there is a genus called Coelatura, this species will be in it. However, some of the species placed in Coelatura by Mandahl-Barth have recently been removed to genera such as Grandidieria, Nitia, Nyassunio and Mweruella by Daget. We expect that as the system of African freshwater mussels comes under more scrutiny, even some of the remaining Coelatura will find themselves in new taxonomic homes. Pilsbry, H.A. & J. Bequaert. 1927. The aquatic mollusks of the Belgian Congo. With a geographical and ecological account of Congo malacology. Bulletin of the American Museum of Natural History 53: 69-602 + 68 plates. Mandahl-Barth, G. 1988. 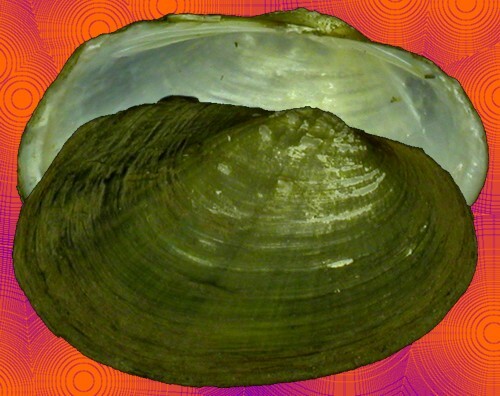 Studies on African freshwater bivalves. Danish Bilharziasis Laboratory, Charlottenlund, Denmark. 161 pp. Daget, J. 1998. Catalogue raisonné des Mollusques bivalves deau douce africans. Backhuys Publishers, The Netherlands. 329 pp.